My stu­dy is a poli­ti­cal and his­to­ri­cal ana­ly­sis of the ways and means employ­ed by aut­ho­ri­ta­ri­an sys­tems of government to con­trol or eli­mi­na­te domestic adver­s­a­ries. Spe­ci­fi­cal­ly, poli­ti­cal mea­su­res employ­ed against the socia­lism move­ment in the Mei­ji era (Mei­ji jidai sho­ki shakais­hu­gi undô 明治時代初期社会主義運動) are inves­ti­ga­ted. 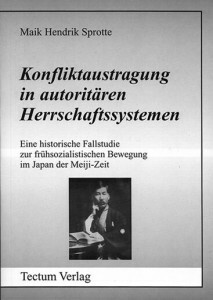 Under the pre­mi­se that mea­su­res and regu­la­ti­ons of the ruling olig­ar­chy against ear­ly Japa­ne­se socia­lism were the result of spe­ci­fic, anti‐socialistic poli­ti­cal doc­tri­ne, mecha­nisms of con­flict esca­la­ti­on, its regu­la­ti­on, reduc­tion, and reso­lu­ti­on are depic­ted. When in the end of the 19th cen­tu­ry socia­list orga­ni­za­ti­ons came into being, this led the government to take strict mea­su­res aimed at the main­ten­an­ce of the socio‐political sta­tus quo which had ari­sen in the 25 years sin­ce the Mei­ji Res­to­ra­ti­on. A cli­ma­te of con­flict exis­ted bet­ween the aut­ho­ri­ties and the socia­lists resul­ting in radi­ca­li­za­ti­on of the socia­lism move­ment and in turn ever ster­ner offi­ci­al mea­su­res against the socia­lists. from the first Japa­ne­se Soci­al Demo­cra­tic Par­ty (shakai mins­hu­tô 社会民主党), foun­ded in 1901, up to the “High Trea­son Inci­dent” (tai­gya­ku jiken 大逆事件) in 1910 wit­hin the frame­work of opp­res­si­ve mea­su­res taken by the Japa­ne­se government. The ant­ago­nism of par­li­a­men­ta­ry socia­lism and anar­chism as two dia­metri­cal­ly oppo­sed instru­ments aiming to trans­la­te socia­listic ide­as into rea­li­ty, which had evol­ved in the Mei­ji Era, is taken into con­si­de­ra­ti­on. The poli­ti­cal mea­su­res of the ruling olig­ar­chy in Mei­ji Japan appe­ar to be a com­bi­na­ti­on of under­stand­a­ble secu­ri­ty inte­rests due to the pre­sence of anar­chism and its revo­lu­tio­na­ry ideo­lo­gi­cal approach and an unscru­pu­lous defence of power, igno­ring the despe­ra­te need of hund­reds of thousands of indus­tri­al workers for fun­da­men­tal soci­al reforms. In con­trast to the Ger­man model, whe­re the “Iron Chan­cellor” Otto von Bis­marck cou­pled his anti‐socialistic poli­tics with far‐reaching and unpre­ce­den­ted soci­al legis­la­ti­on, the bela­ted mea­su­res taken by the Japa­ne­se rulers (“Fac­to­ry Law” (kôjô‐hô 工場法), the impe­ri­al foun­da­ti­on of the “Sai­sei­kai” 済生会, both 1911) were insuf­fi­ci­ent and half‐hearted. On the other hand, the socia­lists´ par­ti­al dog­ma­tism and ideo­lo­gi­cal intran­si­gence led to radi­ca­li­za­ti­on. Both ant­ago­nists of the poli­ti­cal con­flict ended up in a spi­ral­ling cycle of vio­lence.